The Skycap® is a starter and adder overhead service distribution system that is flexible enough to work with your current and future service and communication needs and can be ordered blank, with center snorkels or with offset snorkels. The Skycap® is not capable of having center and offset snorkels in all widths. Therefore, refer to the product model numbers for specific available sizes. Pre-plumbing, pre-wiring, lighting and snorkel options are available through CiF Lab Solutions. The Skycap® allows for multiple units to join together with a single or multiple umbilical feeding service throughout the units. The robust design of the Skycap® makes it an ideal solution. Ceiling suspension allows service connections along the entire system length. 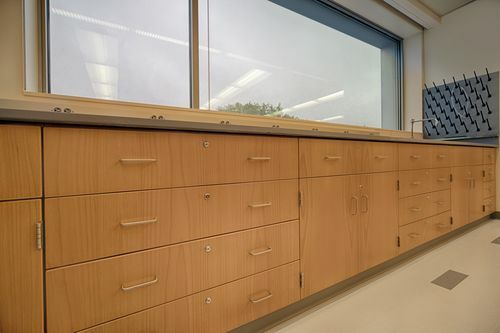 The picture below shows the Skycap® with the CiF Lab Solutions carts. The Skycap® distribution system is a formed steel suspended overhead service carrier that is designed to carry services including water, vacuum, gas, electrical, data and communications. Each section shall have pre-punched plumbing and electrical fixture openings. To achieve multiple section runs, you must move one end-cap from the starter section to the end of the adder section. One starter unit is needed per run. For suspension, incorporate umbilicals and end umbilicals for every service run. Refer to our laboratory specifications for details. Pre-plumbing and pre-wiring is available at the CiF Lab Solutions factory. All supply line are systematically routed and securely clamped inside. The Skycap® is shipped in single (36-, 24-, 60-, and 72-inch) sections or in runs (final length may vary). CiF Lab Solutions may choose to use foam end covers, pallets, shipping pads and shrink wrap; which all can be specified by the customer.